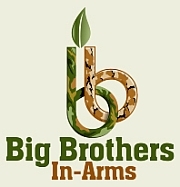 » SNJ – Welcome home CSSN David Martin Warriors' Watch Riders: WE HAVE YOUR BACKS AT HOME! 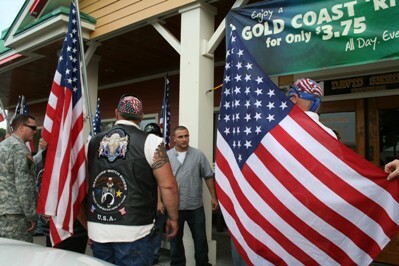 The Warriors Watch Riders gathered at Deptford 6 Movie Theatre on what turned out to be a beautiful Wednesday evening to welcome home CSSN David Martin! We rolled over to the Outback with about 30 bikes, 2 cages, formed a flag line and proceeded with our famous mug and hug for David as well as his New Fiancé. We were given the honor of escorting David, his Family and New Fiancé to the local Aldis’ with help of our LEO’S from Gloucester Twp., Magnolia, Somerdale and Strafford. From there we were escorted around town by Strafford Fire and Police to the awaiting Friends, Family, Community and the Yellow Ribbon Club. Where they once again did what they do! Yet another American Hero home safe and sound Warriors Watch Style! Rock Star Style! 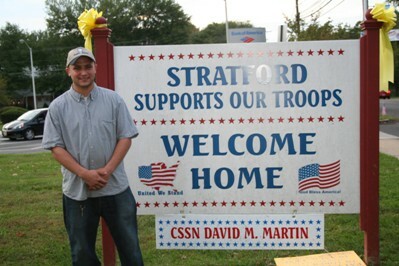 Welcome home CSSN David Martin! No user commented in " SNJ – Welcome home CSSN David Martin "